Just a small little (very belated) fic for Valentine's. Sora wants to show off all the cooking skills he learned working with Little Chef for Riku, in the hopes of expressing something he can't find the words for, but things go awry. Mild KH3 spoilers (basically just the existence of Little Chef and stuff I think? I gloss over all endgame stuff really lol). Anyway, hope you read it and like it, let me know! It was half past eight and Sora had kept Riku waiting. The glow of Twilight Town's perpetual sunset bathed Riku in soft orange as he sat outside Le Grand Bistrot. Sunday evening the bistro closed early so he sat alone at one of the many empty tables and watched the townfolk pass by as they headed off to their homes for the night. They made plans to meet there—Sora beamed with barely controlled glee when they had—for he had a surprise for Riku, he said. Was the surprise never showing up? Riku sighed gently as a soft smile spread across his lips. In the center of the table were a bunch of blue flowers, bright like Sora's eyes. He half-chuckled to himself as he pictured Sora rushing to meet him there, clothes probably askew, hair messier than ever, if that was even possible. In truth, he didn't mind waiting, because he knew without a doubt, late or not, Sora would always show up in the end. And, sure enough, he soon heard the fast paced sounds of sneakers hitting the pavement. His best friend breathed heavily when he came to a stop in front of Riku's table. He wore a sheepish grin as he apologized for being late. Hanging from his shoulder was a tote bag that looked positively overstuffed with things. "What's all that?" Riku asked. "Secret," Sora said with a trademark grin. "You ready?" Riku nodded and stood up from his chair, carefully tucking it back under the table. They headed to the bistro's entrance. Sora gripped the doors with an immense enthusiasm, expecting them to swing open with ease, but groaned in pain when they refused to budge. Once he shook off the initial shock he tried again to no avail. Once more, surely, but alas, nothing changed. "Aw, c'mon!" he exclaimed as he let his arms swing down by his side. "I knooow! But I talked about tonight with Uncle Scrooge! He said he was going to let us use the bistro after hours... I guess he forgot...." He let the tote bag drop to the ground with a dejected sounding plop. "Now what?" "We can just go somewhere else," Riku offered, but Sora was having none of it. He shook his head. "No... I know what to do." With a flash of light he summoned his Keyblade and aimed it squarely at the lock on the door. "Sora, some people call that breaking and entering." "C'mon, Riku, where's your sense of adventure? Besides, Uncle Scrooge said it was fine!" Before Riku could retort a beam of light shot forth from Sora's Keyblade and unlocked the entrance with a satisfying click. Sora beamed once more as he swung the tote bag over his shoulder, nearly spilling its contents in the process, and opened the door with great enthusiasm. "After you," he said in his best attempt to sound gentlemanly. Riku shook his head with a smile as he went inside. Sora led him deeper into the restaurant, both hands pressed against his shoulder-blades. There was no tension or resistance to their movements as they headed into the dimly lit bistro. Riku could barely see, his eyes still adjusting from leaving the sunset soaked street, but he didn't care. He trusted Sora. They'd occasionally bump into a chair or table but all it brought forth was two boyish chuckles, no worries to be found. "Here's good," Sora said as they stopped at a table near the center of the bistro. He pulled out the chair for Riku to sit. "You, uh, wait here, okay? I need to do just... do something and then I'll be right back." "You sure you don't need help?" Riku asked sat down. "I don't mind." "No no no," Sora said shaking his head. "I'm fine. You just wait here and I'll be back before you know it." That familiar grin. And then he was gone, the kitchen doors swinging behind him. Riku watched the doors as they swayed back and forth until they eventually settled into place. He glanced around the room, making out what he could from the light from the street outside. In front of him on the table was a small pot of cherry blossoms and blue daisies and some candles. A heat rose in the tips of his fingers as a small ball of Dark Firaga formed. He lit each of the candles before extinguishing his magic with a shake of his hand. The flame danced in front of him, flickering with his breath. It felt eerie being inside a closed restaurant now that he was alone. In a way it reminded him of walking the streets of the World that Never Was. The absence of people in places known for being in abundance of them... there was always the feeling that something was missing, that something was off. He kept feeling like they were about to get in trouble for being there. He couldn't help but laugh at himself a little, the old cocky Riku he used to be wouldn't have thought twice about going some place he wasn't allowed and yet here he was checking over his shoulder, anxious of being caught. He had done so much growing over the past year or so that the old him felt almost unrecognizable. He had gone soft, tender. And the truth was, he would never be able to express how grateful he was for that. Knowing Sora, caring about him... wanting to protect him no matter what... it had changed him. He had entered a new life, a new self, in being close to him. It was a type of strength he had always sought, but only now did he finally find it. The strength to put everything else aside for Sora, to have no room for fear or doubt. It was the strength to be vulnerable, openly so, to have his heart on his sleeve at all times. There was no hiding how much Sora meant to him, but he didn't need to—didn't want to. Even now, it was a warmth that filled his heart, as sure as the dawn sweeps away the night. He was okay. He sighed into his chair, letting himself relax against the wood back. They were going to be okay. There was no sign of Sora. The candles on Riku's table had decreased considerably in the intervening time. He had tried to sit and wait for as long as he could, but eventually he decided to mull about the bistro as he waited. It was his first time inside and he was still taking it all in. Sora had of course told him about it and his cooking with Little Chef many times over the course of their journey, had even sent him photos of the food they had made together—amazing entrees and beautiful desserts that Riku could hardly believe Sora had a hand in, knowing how clumsy his best friend was—but not many of the pics took place outside of the kitchen. Le Grand Bistrot was nothing like what they had back home on Destiny Islands. Everything here felt so fancy that Riku felt a little out of place being among it all, especially alone. In the time waiting for Sora, he had already studied the wallpaper, the light fixtures, the table arrangements, the flooring, and now, finally, he was spending his due diligence investigating the dessert case. Every one of them looked beyond this world. The intricacies in their presentation. The way that just looking at them began to make him salivate. It was all so fancy it made him feel even more out of place than before. All his life he had never seen such beautiful treats. If he hadn't come here he probably wouldn't have even thought such delicious looking desserts were real. It reminded him a bit of why he always wanted to leave the islands as a kid. He just knew, deep down, that there was more out there, more than the way his world had always lived, more things to discover and know. How it began... he had a lot of regrets, but he would never regret that it happened at all. They were all living a richer life getting to see what else was out there. A bunch of desserts in a sun-soaked bistro might not have seemed like much, but it was a small piece of something better. New experiences, new realities, new possibilities, they were now open to them in a way they never had before. It was exhilarating, really. He never knew what new thing awaited around the corner, what new life he'd run into next. And there wasn't anyone else he'd rather do it all with. 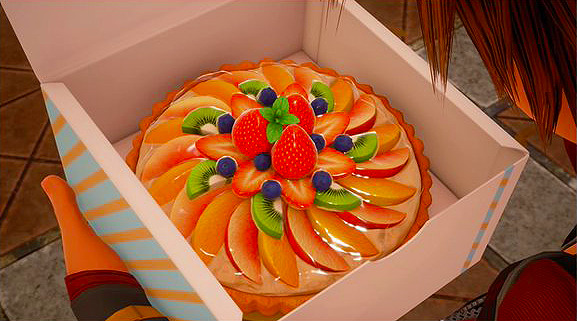 Riku stopped on one dessert in the case. At first glance it didn't seem nearly as fancy as the others, but something about it caught his eye. It looked like a pie of some sort. All along the top was various fruits cut and arranged just so. Apple and mango slices alternated in a windmill pattern on the bottom. Then came a row of kiwi slices. Then sliced strawberries lined with blueberries. On the top three whole strawberries crowned it off with a sprig of mint at the center. Just looking at it brought a smile to his face, he could practically feel joy radiating off of it. It reminded him of Sora. While looking at the dessert fondly Riku heard a big bang come from inside the Kitchen and the sound of Sora yelping. Without even thinking he raced through the swinging doors, calling out for Sora. His eyes widened at the sight. The entire kitchen was a complete disaster, so unbefitting the sparkle and shine of the rest of the bistro. There wasn't a surface that wasn't covered in mess. Flour. Egg yolks. Spilled spices. Ruined or burned dishes all over. Splatter on the appliances. Smoke was emitting from charred pans on the stove. Broken dishes (what must have been the bang he heard) were scattered on the floor next to large pepper and salt grinders. And among it all, Sora. He sat with his knees to his chest and his head down. His jacket, like the rest of the kitchen, was covered in flour and egg splatter and whatever else he had managed to get into while Riku waited. Some of the mess had even manged to get into the spikes of his hair, all along his arms and hands, his pants and shoes. It was a disaster. Riku hurried over to him. "Sora, are you okay?" "Y-yeah," Sora replied weakly, his voice cracking and muffled against his knees. "I just..."
He sat down beside him, careful not to sit in any broken glass. Sora looked over, the bottom of his eyes lined with tears, flour on his cheeks. The sight caused a hitch in Riku's breath. He would never get used to seeing Sora cry. Without even thinking he gently reached over and wiped some of the flour off of his friend's cheek with his thumb, only to pull his hand back sheepishly, feeling instinctively that he was crossing some imaginary line. He clenched his fist. "What happened?" he asked after a moment, never taking his gaze off of Sora. Sora dropped his knees, letting his legs splay out and his arms fall to his side in one dramatic movement. He let his head fall back only to grimace as it collided with the red metal cabinet drawers behind him with a thick thud. Rubbing the spot, he let out a frustrated groan. "You ever have one of those days where you just can't win?" "What were you trying to do?" he asked, looking back at the result of Sora's attempts. Sora sighed. "I wanted... I wanted to show you just how much I've learned. I've been cooking with Little Chef throughout my whole journey and I really thought I was good, that I could do something special for you." He smiled softly. "I wanted to make this big dinner for you, Riku. Wanted to show you how much I could do, how good I was at cooking now, but...." He looked at his hands, caked in food splatter, flour, yolks, even some minor burns. "Little Chef, he kind of controls me by pulling my hair. Together we made all these beautiful things and I really thought I was learning stuff, that I was getting good, too, but it looks like it was all him. I don't actually know how to do anything without him." Sora let out a short empty laugh. "I'm useless." His lip trembled but he wiped away at it with his fist. "I'm sorry," Sora said resting his head against the cabinet drawers, gaze to the ceiling. "I ruined our whole day." Riku shook his head. "It's not over." He got up off the floor and held out his hand for Sora. "C'mon. We'll clean this place up together." Sora smiled and took his hand. "Okay, Riku." Once up, they both looked over the immense amount of work in front of them. Riku didn't know how Sora managed to make this much of a mess in what felt like a pretty short time, but he had exceeded any expectations for what he thought possible. He was pretty sure there was even food on the ceilings. But it didn't matter, together, they could handle it. Riku took of his jacket and folded it and set it neat on the one clear area of the kitchen. He motioned for Sora to do the same and he did, chucking it playfully at Riku's head. He caught it before it came to that, of course, but they both grinned at each other anyway. Once cleaning the jacket to the best he could, he set it beside his own and then grabbed two aprons from a nearby hook and tossed one back to Sora. The fact that he hadn't been wearing one this entire time said a lot about how little he learned, but Riku kept that to himself with an amused chuckle. He put on his apron, tying it expertly behind his back, and then leaned over to help Sora tie his. Sora nodded confidently, a renewed vigor taking hold. And so, they got to work. Riku and Sora were putting the finishing touches on the kitchen. Sora was putting away the clean dishes from the dishwasher while Riku wiped down the last of the surfaces. It had taken them much longer than either of them thought, but Riku didn't mind. They had filled the time with jokes and laughter and telling each other stories about the things they had seen on their journeys. In truth, all Riku really wanted out of the day was this, just being with Sora, hanging out with him, talking and breathing in the same air. Whenever they passed by each other in the kitchen they'd knock their hips together. A booty bop, Sora called it. It was stupid, Riku knew, and yet he found himself cherishing the contact, the smiles that followed and the general warm feeling that lingered in the air. It was a good day, as far as he was concerned. When they had finished cleaning everything, they turned off the lights in the kitchen, and tidied up any extra evidence of their having been there. As they headed for the entrance Sora couldn't help but express disappointment. "Maaan," he began, "we still don't have anything to eat. The night's still a bust." They were about to leave when Riku stopped. He looked back at the dessert case and the doors to the kitchen. He clenched his fist. "Sora," he said as his friend was halfway out the door. "You go on ahead. I forgot to do something." "Are you sure?" Sora asked with a tilt of his head. "Yeah. I'll meet you on the rooftop by the outdoor theatre, the one with the patio table, yknow the one?" Sora nodded. "Don't take too long. And don't forget to lock the door behind you," he said with a wave of his hand as he turned and left the bistro. Riku watched Sora head down the street, his arms behind his head as he walked casually. When he was out of sight, he turned back to the kitchen. The double doors swung behind him as he grabbed an apron off the hook. He took off his jacket once more and grabbed a pan from the shelf. He got everything prepared: the recipe, the ingredients, the utensils, the plates, the to-go boxes. Riku tied his apron behind his back tight and took a breath. Riku brushed Sora's feet off of the table sending the boy jolting awake from his casual daze. He chuckled and placed three to-go boxes from Le Grand Bistrot on the table as Sora regained his composure. "What took you so long?" Sora asked. "This." He opened two of the boxes and carefully pulled out two plates and set them on the table in front of them, along with the cutlery. "Woaah!" Sora exclaimed as he looked at the dinner Riku had made for them. A beautifully cooked piece of fish sat in the center of each plate surrounded by a light green sauce and bite size chunks of mushroom arranged in a circle around the fish. He recognized it as one of the meals they served at the bistro. "Is that...?" "Sea Bass Poêlé," Riku said with a small grin, unable to hide his pride. "Did they have leftovers in the restaurant or something?" Sora asked as he inched his chair closer to the table, nearly drooling. Riku shook his head. He handed his friend some napkins. "I made it." "I didn't know you could do that!" Sora didn't wait any longer. He grabbed the knife and fork and took a bite, letting the flavours mix and mingle on his tongue. His eyes watered slightly. "It's so good, Riku," he mumbled through a bite. "It reminds me of home," he said softly. "But, like, fancy." "It was nothing," Riku lied before starting to eat his own plate. "But I'm glad you like it." "It's amazing, Riku!" Sora said with unrestrained enthusiasm. He shook Riku by the bicep to drive the point home. "I can't believe you did this. Man, it kinda makes me feel bad for messing mine up," he said with a laugh. "Since when did you know how to cook?!" Riku rested his fork and knife on the plate, his gaze downward for a moment. "The year you were asleep," he said simply. And then, he picked them back up and went back to eating like it was nothing. "I had to learn how to take care of myself." So I could take care of you, he thought. "It was scary at first. I didn't really know how to do it, but I managed and I found I actually really liked it." "I see...," Sora said. He had already finished his food, but he put his utensils down on the plate, too. "I didn't think about how hard that must have been for you. When I woke up and you weren't there, I was just so focused on finding you I didn't think about what you must have gone through while I was gone." "It's okay, Sora, really. We're together now, right?" A comfortable silence arose over them. The ever-setting sun cast them in warm pinks and oranges. Every now and then they would catch each other's eye, give a soft smile, and then return to watching the colours streak across the sky. When Riku finished his food, Sora tidied up all the dishes and packed them away. Riku got up from his chair and grabbed the last to-go box and placed it in front of Sora. "Dessert," he said. "It kinda reminded me of you." Sora opened the box and a huge grin stretched across his face. Inside the box was the bright fruit covered dessert. "Ah! The tarte-a... whatever-it-was! I love these." He jumped to his feet and immediately got to work cutting the tarte into slices and placing on on each of their plates. Riku thanked him as they settled back into their comfortable groove of watching the setting sun, the sweet taste lingering on their tongues. It was delicious. So fresh and full of life and joy. To Riku, it reminded him so much of his friend, of home. A warmth was growing inside his heart. "Why was this so important to you?" he asked him seriously. "Making me a dinner, this big surprise?" "Hmmm," Sora said, the fork danging from his mouth as he thought. He pulled it from his lips and rested his chin on the heel of his palm. "I guess...."
"It's not that." Sora put the fork down on his plate. He kept his gaze locked onto his hands resting in his lap. "Uncle Scrooge said... He said that truly good food... You put your heart into it, you know? You take all of your feelings and you put it into the food, and you make it, like, an expression of how you really feel, I guess? I don't know...." He sighed and leaned back in his chair. "It's a way of expressing things that you have a hard time saying. That you can't bring yourself to say even if you really want to. When you taste it, you can taste that feeling, that care, that... I don't know...." Sora gave a weak smile. "Maybe it's silly." Riku thought back to making their dinner. The way his hands had shook as he made it. The stress to get everything just so. He thought about the way he grilled the fish skin-down until it had the most perfect, tantalizing crisp. How he agonized over the spices he used, the way he placed the chanterelle mushrooms, the way he dished the sauce. He wanted everything to be perfect, but not for him. For Sora. He was putting all his heart into that meal. "I get what you mean," Riku said softly, with a gentle smile to match. "I know it didn't turn out how you wanted it to, but I really appreciate it, Sora. Thank you." Sora beamed. "You, too. This dinner was better than anything I could've cooked up. Hey, maybe you should work for Little Chef." They both laughed. When the laughter died down, they turned back to their dessert, scooping it happily into their mouths, knees touching under the table. The warmth rising in their hearts never dissipated, it continued to grow as the night bore on. There was genuine comfort in that silence, in being next to each other, in doing something as simple as watching the setting sun, the breeze light against their skin. After a while, they packed away their dishes and boxes. They climbed up higher on the rooftop, away from the balcony, so they could see more of the horizon. Their feet dangled over the edge casually. Riku looked at him. "For what?" "For making you wait. The year I was asleep." He shook his head. "No, today, too. I left you waiting for me outside the restaurant, and then I made you wait even longer while I was in the kitchen. I keep doing it and I really don't mean to, but I'm sorry." Riku smiled. "It's okay, Sora." He looked into his blue eyes, let his gaze linger on the way their arms were touching, the way their feet sometimes knocked together, before turning back to the horizon. "You're always worth the wait." The way he said it hit Riku right in the heart. He knew how Sora felt, and he knew how he, himself, felt, too. There wasn't a day that went by where Riku wasn't grateful for the new life he had entered in knowing Sora, in being close to him, in caring for him. Loving him... That love filled Riku heart and every fiber of his being. It pushed out all other feelings, all other worries. It was a special kind of strength, one to protect everything and everyone he cherished. But more than that, it was the strength to be open, to be vulnerable, to let people in. Sora cared so much. He was always So Much. When they were younger, it frightened Riku, scared him. He felt inferior in his shadow, insecure in his presence, like the more Sora cared openly the faker he felt for bottling it all up inside. But no more. That's not who he was, or how he felt. He was free. There was no room for that inside his heart, it was already full to bursting. Riku glanced over at Sora. He was waiting expectantly. The look in his eyes, Riku recognized it. Everything that was unsaid between them. It was a lot. But it always was, and always would be, a comfortable silence. Riku knew that they had their entire lives in front of them, that they would be together always. There would come a time where the words would need to surface, need to be said and known, but for now, it was okay. They were okay. They were together, and they always would be. And so, with no room for fear or doubt, he took Sora's hand in his, fingers intertwined, and they watched the perpetual sunset in front of them, as their future together stretched forth far into the horizon, an ever expanding love rooting in their hearts. I read this last night but I was so exhausted from my long work day that my brain didn't really take it in, so I read it again this morning and cried because of how soft it is. This is truly wonderful, Audo! I love that both Sora and Riku have this silent understanding of their feelings for each other, but they just aren't ready to say it out loud. It fits them well. Sometimes I like to think of Sora and Riku just getting closer and closer and more and more romantic with each other and they just fall into it totally without ever defining it and then one day someone asks them if they're boyfriends and they're both just like "huh... yeah i guess we have been this whole time??" I do! I have a compilation thread here that links to them all. Unfortunately due to the forum switch some of their formats might be all wonky now and I don't think I'm going to go through the hassle of fixing them all up since that'd take a lot of time. But, I also have them all posted on my AO3 as well.